Get up to 85% Faster Drilling and 85% Harding Hitting while reducing Vibration to only 10.6 m/s2. 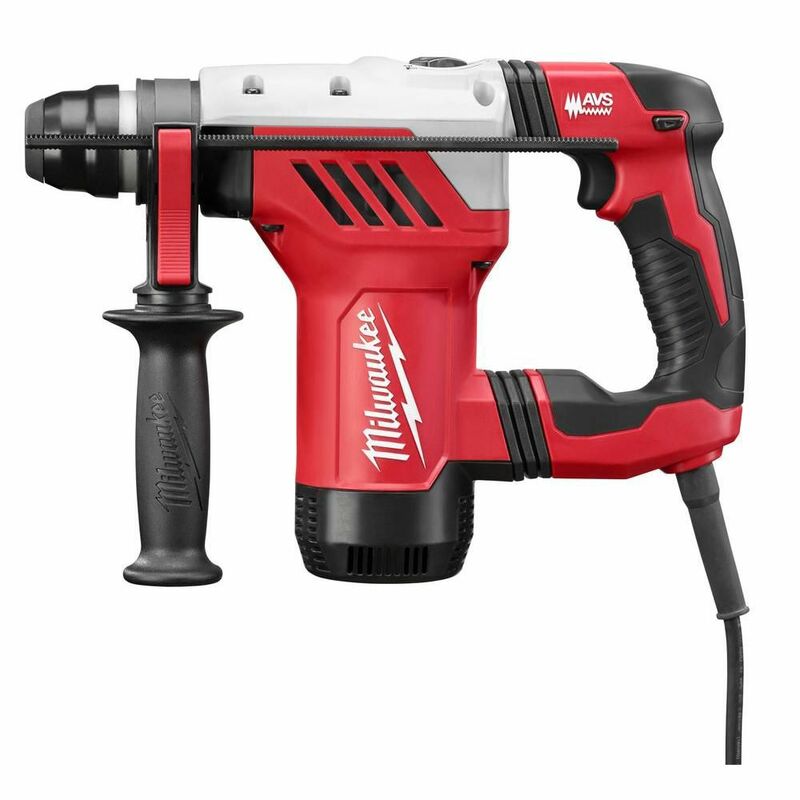 With a powerful 8 amp motor, this rotary hammer delivers 0-1,500 RPM, 0-5,500 BPM and 3.6 ft.-lbs. of impact energy. This tool also has an all metal gear case and mechanical clutch to provide maximum durability. At only 12-1/2 inches long and 7-1/2 lbs, this tool makes for a very powerful and lightweight 1-1/8 3-mode rotary hammer. The kit includes a side handle, depth rod and carrying case. The Bosch GBH18V-20K21 18V 3/4- inch SDS-plus Rotary Hammer kit features a light, portable rotary hammer with an exceptional impact-to-weight ratio to deliver performance and efficiency. The GBH18V-20 hammer powered by an 18V 4.0 Ah FatPack battery drilled up to 100 1/4 inch diameter holes 1-1/2 inch deep into concrete. With 1.3 ft.-lbs. of impact energy and a no-load bpm rating of 0-5,850, it'll work as hard as the user. It provides three modes of operation rotary hammer, rotation only and hammer only. This hammer works with Bosch PRO+GUARD dust solutions, an end-to-end dust-collection system that helps users move toward OSHA Silica Table 1 dust compliance. At only 5.7 lbs. (tool only, not including battery), it has an ergonomic design and soft-grip handle. It has Electronic Motor and Cell Protection to protect the tool and battery from overload. The kit includes two 18V 4.0 Ah FatPack batteries and an 18V charger. The DCH273P2DHO 20V MAX XR Brushless Rotary Hammer is a high-performance drill that is powered by a DEWALT brushless motor and a durable German engineered mechanism that delivers 2.1 joules of impact energy. Coupled with its light weight design and SHOCKS Active Vibration Control technology, this hammer is ideal when used in overhead applications. The DCH273P2DHO dust extraction system features a powerful built in motor for increased suction and high performance drilling. The 2-second power-off delay ensures that dust extraction continues after drill is switched off. Featuring a durable clear high capacity dust box, replaceable dust nozzle, replaceable HEPA Filter, and a quick release for easy attachment and disassembly. Benefiting the user with the ability to use carbide drill bit diameters up to 5/8, which allows users to drill overhead for 1/2inch dropins. The DEWALT DW511 1/2-in Variable Speed Reversible Hammer Drill features a high-performance 7.8 Amp motor that provides overload protection. This dual-mode hammer drill is ideal for wood, steel and masonry applications and offers a 360 degree side handle with depth rod to help deliver great control, versatility and depth accuracy. This hammer drill has a lightweight design to help limit user fatigue, as well as a 2-finger rubber trigger for comfort. 1-1/8 Inch. SDS Plus Rotary Hammer Kit Get up to 85% Faster Drilling and 85% Harding Hitting while reducing Vibration to only 10.6 m/s2. With a powerful 8 amp motor, this rotary hammer delivers 0-1,500 RPM, 0-5,500 BPM and 3.6 ft.-lbs. of impact energy. This tool also has an all metal gear case and mechanical clutch to provide maximum durability. At only 12-1/2 inches long and 7-1/2 lbs, this tool makes for a very powerful and lightweight 1-1/8 3-mode rotary hammer. The kit includes a side handle, depth rod and carrying case. 1-1/8 Inch. SDS Plus Rotary Hammer Kit is rated 4.4 out of 5 by 51. Rated 3 out of 5 by JCBINC from Chuck did not work correctly. It was a struggle to get SDS plus bit into chuck. The drill sinks h... Chuck did not work correctly. It was a struggle to get SDS plus bit into chuck. The drill sinks holes really fast in concrete with Bosch bits that can drill through rebar. When I went to the store the Milwaukee rep could not get the bit in the chuck easily either. We have three Milwaukee rotary hammers and this is the first one that had this problem. The new 5 inch grinder that came with the drill lasted less than 5 minutes on light slag removal and smoke poured out and it slowed down. Almost DOA. Milwaukee 4 1/2 grinders did the job just fine and did not burn up. The new Milwaukee metal cutting circular saw had the spot welds holding the bottom plate break on 3/16 plate in about 2 feet of cutting in less than one minute. More trouble. Rated 5 out of 5 by Kelvin from Really good tools. Really good tools. Rated 5 out of 5 by Mark from Highly recommend picking up a proper rotary hammer tool. ... Highly recommend picking up a proper rotary hammer tool. Aside from getting a great deal on this one (along with an angle grinder included) it cut down the time to install a few masonry screw anchors from several minutes of high pitched, high effort drilling down to less than a minute of easy work.